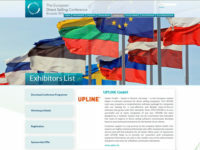 Efficient We have in-depth experience in your sector – Upline has been very successfully implemented for over 20 years. Leading Upline is one of the main players in the area of software solutions for MLM and direct selling companies. Customized Upline provides the best solution for optimum scalability - you only pay for what you really need! Sustainable Upline's architecture ensures a long software life cycle – without high purchasing and maintenance costs for the IT infrastructure. Modular Upline is the competent technology partner for companies of all sizes – from small-scale businesses to globally acting corporations. Flexible Your compensation plan is the key to your success. Upline makes sure there are no limits here - we realize any kind of plan for you. Well-structured Upline is able to incorporate a swiftly growing customer and distribution partner base and offers immediate access to the associated information. Powerful Upline effortlessly handles many hundreds of thousands of orders as well as customer invoices and commission statements. Informative Upline provides you with a mulditude of statistics and reports enabling you to effectively manage your business and distribution partners. International Upline operates around the world on 6 continents and in over 200 countries. Many country-specific features have already been developed and market-tested. Upline is a software package specializing on administration and accounting for decentralized or branched-off distribution channels as used by companies in the sectors of direct selling, multi level marketing, network marketing and also referral marketing. Are your running or planning to start a direct selling company or to introduce a new distribution channel to your company? Then we are your competent partner for the introduction and implementation of your IT supported direct selling distribution system. 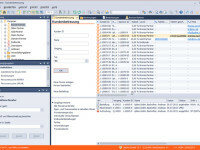 Success in direct selling requires flexible and powerful software. By choosing Upline, you make a conscious decision in favour of a modern platform that effortlessly handles the demands of direct selling companies. Upline is flexible and grows with your demands. Benefit from its modular setup - start with a small package and manageable costs and let Upline's software environment grow as your company prospers. 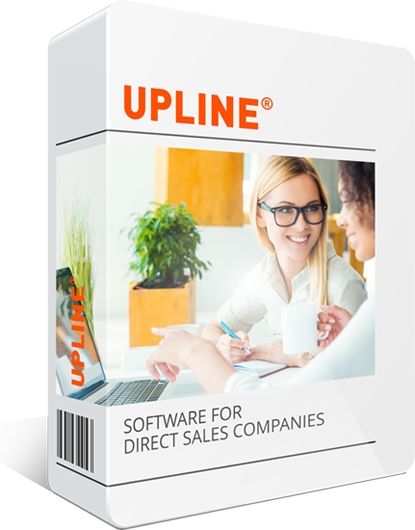 The Upline software package has been successfully used by direct selling companies since 1993. The following quick links give you a short overview of our services. We are industry specialists and are looking forward to setting up your direct selling or network marketing company. Upline GmbH, with its headquarters in Munich, Germany, is a business leader in the sector of integrated software solutions for MLM and direct selling companies. We are the competent technology provider for businesses of all sizes - from small start-ups to large enterprises operating on a global scale. 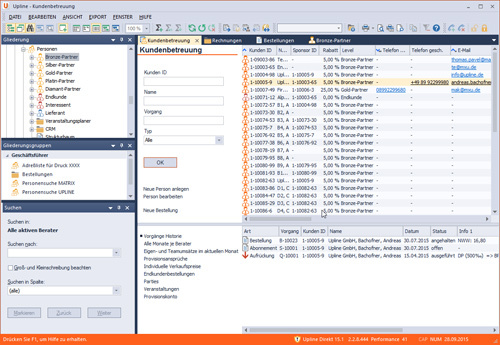 Upline GmbH is the only software provider for the direct sales sector officially recommended by the Bundesverband Direktvertrieb Deutschland (BDD, the Direct Selling Association of Germany). 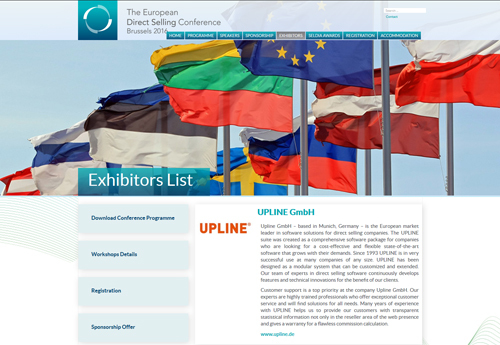 Upline GmbH is the only direct selling service provider in the whole of Europe for Seldia (the European Direct Selling Association). Upline operates world-wide on 6 continents and in over 200 countries. We started out in 1993; since then, we have provided numerous direct selling companies of various sizes with our Upline software package. Over the years we have acquired expert knowledge in the direct selling and network marketing sector. Our team members have university degrees in informatics, mathematics or comparable training as well as industry knowledge in the field of direct selling. Our team of highly qualified software engineers is constantly working on refining Upline as well as developing individual implementations to suit our customers' needs. Upline offers you not only 20+ years of expertise in the field of direct selling software, but also substantial know-how in direct selling. We also pride ourselves on our outstanding customer support - our support staff are available to help you at any time. An easy questions to answer: We want to enable our customers to focus entirely on their core business. Anything to do with implementing and running a central business software is not part of it - let us handle it for you. With Upline you will be using a state-of-the-art software specializing in direct selling and MLM. Its modular structure makes it possible to customize the Upline software package to the specific needs of your company. We would like to work with you as your reliable business partner for many years to come. Place your IT supported business model in our capable hands!